Origin and Habitat: Pigafetta filaris is indigenous to New Guinea and the Moluccas, in Indonesia. Altitude: Up to 300 metres above sea level. 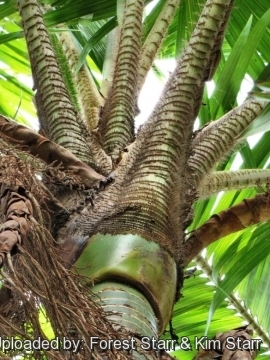 Habitat and ecology: It is a fast-growing, overstorey palm found in wet disturbed forests on lavas, banks of water streams and margins of the forests. 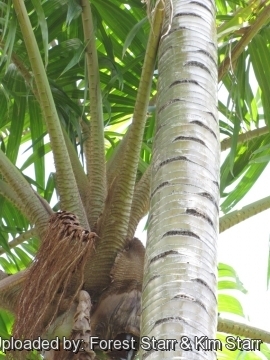 It is one of the very few strictly secondary forest palms. Pigafetta filaris is apparently a strict heliophile when it is young. Seedlings deposited in bird dung in primary forests do not develop beyond the two- or three-leaf stage, whereas seeds deposited in dung in the open develop rapidly. It acts as pioneer plant colonizing degraded areas in open areas and in full sun. Like the fishtail palm (Caryota spp.) the slender P. filaris bursts through the lowland forest canopy, in search of sunlight. Description: Pigafetta filaris has a very tall, green, broad, solitary, glistening trunks and a large crown of pinnate leaves with whitish stalks. As with many palms, Pigafetta filaris protects itself with a carpet of sharp spines. It is a dioecious palm, with male and female flowers borne on different trees on an inflorescence that emerges below the crown. The whole look is incredibly tropical and ornamental. Taxonomical notes: The specimens which generally are found in botanical collections around the world appear to have come from the Indonesian island of Sulawesi and will have to be renamed (Pigafetta elata). Trunk: Straight as a telephone pole, more than 30 m tall, with individuals, in the wild, even 50 m tall, and a diameter of 30-45 cm, glossy green for a good part of its length, tending to the brown in the oldest part, and ringed with the scars of the old leaves. It has often a mass of adventitious roots at the base. Leaves: Pinnate up to 6 m long, arching. Petioles robust, about 1,8 m long, grey-green covered by a white powder with base not completely surrounding the stem and very spiny, the spines are pale yellow, flexible, about 7 cm long and arranged in slightly undulate linear jagged rows. Leaflets dark green long, thin and acuminate, about 1 m long and slightly pendulous, with short bristles at the margins and along the central nervature. Regularly inserted along the rachis and forming a V.
Inflorescence: Axillary, similar in the feminine as well as in the masculine plants, pale yellow, about 2 m long. Peduncle and rachis disposed horizontally with pendulous floriferous branches. Fruits: The small ovoid, about 1,2 cm long, covered by imbricate yellow to orange scales and contain one seed only. 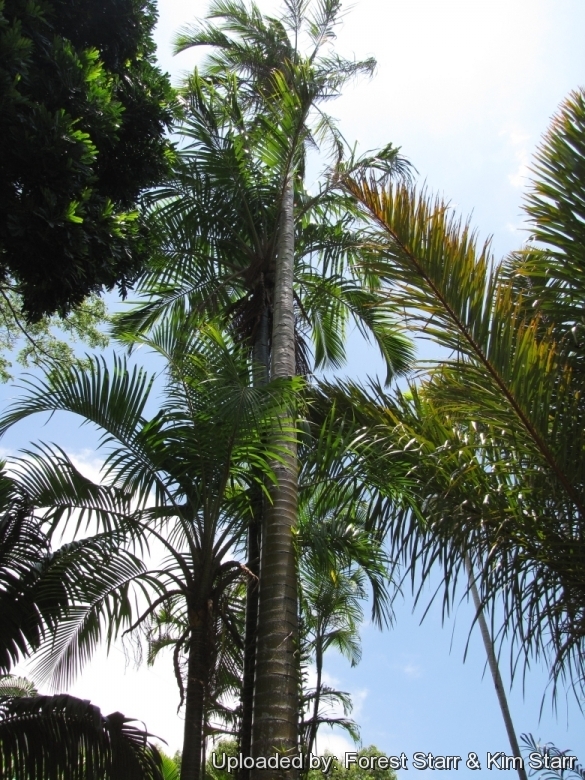 Notes: Along with Ceroxylon alpinum (reported to reach 60 m), Pigafetta filaris (reaching 50 m) is one of the tallest palms in the world. Other extremes among palms are the long climbing palms that represent some of the longest land plants: e.g., Calamus spp. recorded as 185 m long. 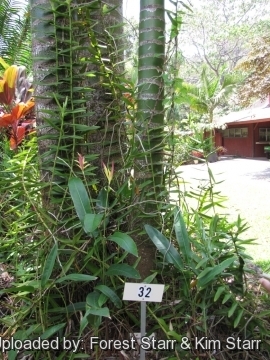 In contrast the smallest undergrowth palms scarcely reach 20 cm: e.g., Iguanura palmuncula. 1) Forest & Kim Starr Pigafetta filaris (wanga palm, white wanga palm). Plants of Hawaii. <http://www.starrenvironmental.com>. Downloaded on 31 August 2014. Cultivation and Propagation: Pigafetta filaris is a splendid, little-known ornamental palm that is not demanding about the soil, it may grow up also on the poor ones both slightly alkaline and acidic, provided there is abundant availability of water all over the year, but, of course, takes advantage in presence of soils rich of organic substance and with regular fertilizations. This fast growing tree appreciates an open, sunny site with regular water and prefers subtropical to tropical climates. Growth rate: It is a fast grower, but it can grow extremely fast given the right conditions of warmth and humidity, together with a rich soil and an abundance of water and probably one of the fastest growing palms in the world. The growth, after the initial seedlings phase, is particularly fast, almost one metre of growth per year in the optimal cultivation conditions. Pigafetta filaris vary in shape. Specimens raised in dry and/or infertile soils tend to be smaller in stature with smaller leaves. Hardiness: This palm is tender and is suited for tropical or warmer subtropical climates, (USDA Zones 11-12). It doesn’t stand long periods of temperatures even relatively mild; its growth stops already by around the 13-15 °C. Uses: Either as a single specimen or in groups, this is a strikingly beautiful species. Its very neat appearance and stature makes it perfect near highways and used to accent residential landscapes. Culture in containers is possible although growth rates are slower. Traditional uses: The thin fibres obtained from the leaves were utilized for making clothes, carpets, etc., whilst the stems were utilized for the constructions. Warning: The plant protects itself with a carpet of sharp spines, so careful where you plant this palm. Propagation: Fresh seeds germinates rapidly in 4 weeks although some seed may take up to 6 months to germinate in warm media at the temperature of 24-28 °C and the seedlings are attractive. The sowing must be done at the maximum luminosity, also in full sun, in the shade, the young plants do not develop and finally will die.